Lord Edward Tremaine comes to the fog-shrouded Chateau Morvan on the coast of Brittany. In this ancient building, all the inhabitants have secrets. The old vicomte demands that his descendants find a lost treasure, but he offers only hints to help the three cousins in their search. The beautiful and charming Delphine seems to be a creature of gaiety and sunshine, but every now and then glimpses of something darker appear. Marguerite, the brilliant pianist, is withdrawn in grim silence. Antoine, who considers himself a modern man, ignores the swirling emotions, concentrating only on the money needed for his steel factory. Lord Edward wants to help his friend Antoine, but can he do so before tragedy strikes? 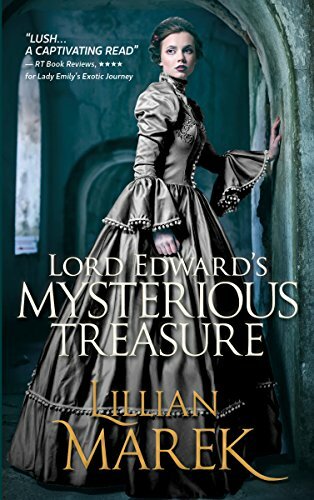 I adore a good Gothic historical novel and 'Lord Edward's Mysterious Treasure' fits the bill perfectly. It is beautifully researched and the little snippets of factual information about the era blends brilliantly with the romance and suspense in the story. Set in a crumbling French chateaux some time after The Siege of Paris it develops a gothic feel right from the beginning when Lord Tremaine arrives at the old castle and he meets its strange inhabitants. The tension and fear among the ladies in the house is tangible and Lord Edward is soon embroiled in their problems which centre round Delphine's theatrics and spiralling mental disorder. The hunt for the treasure makes an intriguing adventure and Ned's suspicious illness and suspected poisoning makes for suspenseful reading. I enjoyed the romantic angle as well and I was rooting for Marguerite and Edward from the beginning. Delphine is a beautiful, tragic character with a flawed personality which only becomes apparent as the story progresses. At the beginning of the novel I assumed her to be the beautiful heroine but her true colours quickly shone through and she became more unlikable as she retreated into her grandiose fantasies. I liked the familial bond Edward had with his parents and how they thought nothing of spontaneously travelling a great distance to visit him in order to extricate him from trouble. Edward is a naive, young man and it felt right that they would jump to protect him. They make an interesting family and I will certainly be going back to read the first three books in the series. Books 1-3 are available right now and 'Lord Edward' will be out on the 7th of November. Hi there! I agree, the cover is gorgeous.